It could be said that women invented science fiction; after all, Mary Shelley's Frankenstein is considered by many to be the first science fiction novel. Yet some readers seem to have this funny idea that women don’t, or can’t, write science fiction. Some have even gone so far as to accuse women of destroying science fiction with their girl cooties. So to help prove how silly that notion is, LIGHTSPEED's June 2014 issue is a Women Destroy Science Fiction! special issue and has a guest editor at the helm. 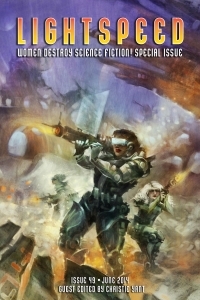 The issue features original fiction by Seanan McGuire, Charlie Jane Anders, N.K. Jemisin, Carrie Vaughn, Maria Dahvana Headley, Amal El-Mohtar, and many more. All together there's more than 180,000 words of material, including: 11 original short stories, 15 original flash fiction stories, 4 short story reprints and a novella reprint, 7 nonfiction articles, and 28 personal essays by women about their experiences reading and writing science fiction. Also included is an excerpt of the novel Artemis Awakening by Jane Lindskold. This is the EBOOK edition. If you'd like to buy the issue in trade paperback, it is available from Amazon.